Riot Fest has revealed the lineups for its upcoming festivals in Chicago and Denver. Now in its 12th year, the festival’s flagship event, Riot Fest Chicago, takes place September 16th – 18th at Douglas Park. And, once again, the lineup is absolutely bonkers. 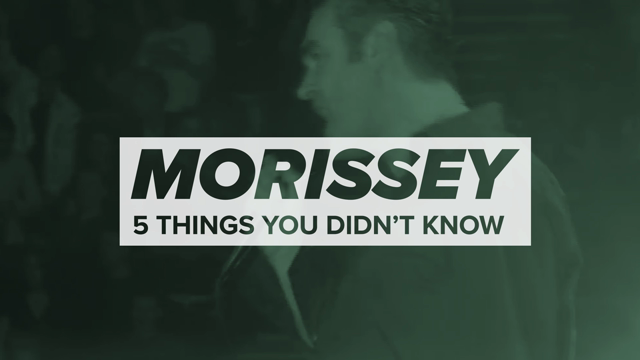 In addition to a previously announced reunion of the Misfits’ founding members, the lineup boasts Morrissey, Ween, Social Distortion (performing White Light, White Heat, White Trash), Rob Zombie (performing White Zombie’s Astro-Creep: 2000), Death Cab For Cutie, Brand New, NAS, Deftones, Refused, Death Grips, Descendents, The Specials, Foo Fighters side-project Chevy Metal, and Fugazi offshoot Girls Against Boys. 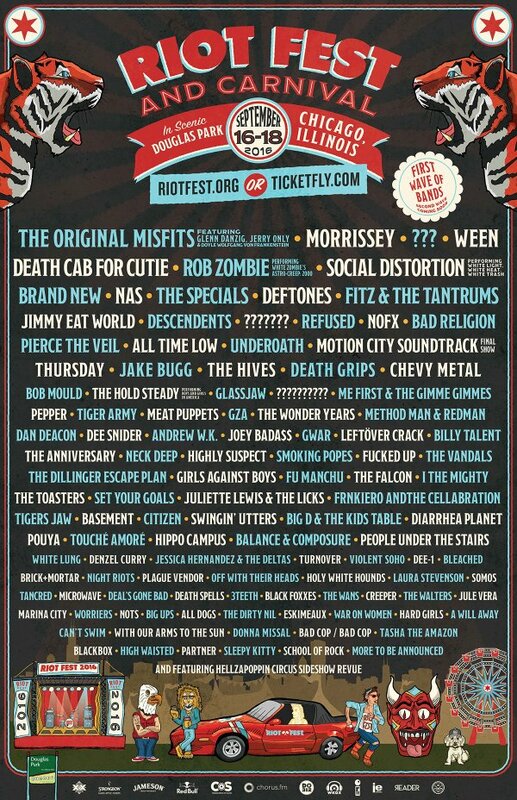 All your favorite bands from high school are also playing Riot Fest Chicago, including NOFX, Bad Religion, Jimmy Eat World, Thursday, Underoath, The Anniversary, The Hives, Glassjaw, Leftover Crack, Smoking Popes, Pepper, Motion City Soundtrack, and Big D & The Kids Table. And if all that isn’t enough for you, the lineup is rounded out by The Hold Steady (performing Boys & Girls in America), Bob Mould, Meat Puppets, GZA, Method Man and Redman, Dan Deacon, GWAR, Joey Bada$$, Andrew WK, Fucked Up, The Dillinger Escape Plane, Juliette Lewis & The Licks, Diarrhea Planet, Touché Amoré, Hippo Campus, White Lung, and Denzel Curry, among many others. 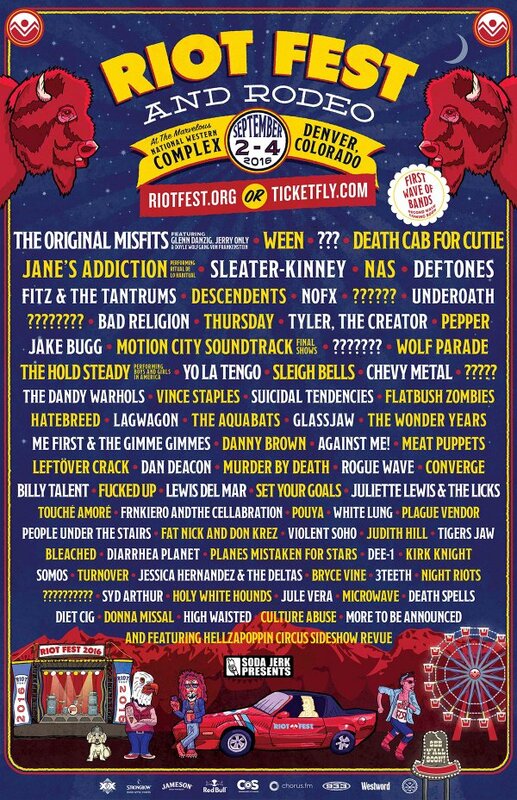 Riot Fest Denver takes place two weeks earlier, September 2nd – 4th, at the National Western Complex. The lineup also boasts The Misfits, Ween, and Death Cab For Cutie along with exclusive performances from Sleater-Kinney, Jane’s Addiction (performing Ritual De Lo Habitual), Wolf Parade, and Tyler the Creator. Alson on the Denver bill are NAS, Deftones, Descendents, Sleigh Bells, Chevy Metal, Vince Staples, Flatbush Zombies, The Dandy Warhols, NOFX, Underoath, Bad Religion, Thursday, The Hold Steady (performing Boys & Girls in America), Yo La Tengo, Suicidal Tendencies, Danny Brown, Against Me!, Converge, Fucked Up, Meat Puppets, Juliette Lewis & The Licks, Touché Amoré, Glassjaw, Diarrhea Planet, White Lung, and Lagwagon, among others. Additional acts for both Riot Fest Chicago and Denver will be revealed in the coming weeks. Tickets for Chicago can be purchased here, and Denver here.